The android version is fantastic! Performs great and I love the usability tricks like the highlighting toggle and the continue button in conversations. The text seems a bit small though. Would it be possible to put a setting field for font size (percentage of original or something) in the baldur.ini? I've already altered the framerate, which works great, but as you can see in the screenshot, there plenty of room for a larger font. And this way, people can determine the size they want. You can put in any number between 1 and 6; 1 is the same size used on PC, and 6 is optimal for a phone. Thanks! That's exactly what I was looking for. Is there a list of all the options for the baldur.ini anywhere? I did a search for font size, bit didn't find this option on the forum. I wouldn't object to an increased size above 6, to be honest, but 6 is ideal. @Troodon80 can you take a screenshot and post what it looks like on your Nexus 7? Might be worthwhile to have some tools for comparison. Font size is new, developed specifically for the Android release. I don't believe there's a comprehensive list of ini settings anywhere (and there are some that you definitely don't want to know about because they do...weird things...). @Dee‌ I agree on having a list of the options from the baldur.ini. It could have been very helpful for all those that have a Mac with Intel graphics card and couldn't disable the shaders until someone posted how to do so on the forums. Plus, you won't have to answer to the "what's the ini setting for X or Y?" Typeof questions. 1, 2, and 4 all appear to be unique sizes, but 3 is the same as 2. 5 and 6 appear to be the same as 4. On my Nexus 7, 2013 — BG:EE v1.3.1226 — 4 (or 5 or 6) is most suitable for me. I'm also interested on increasing the font but I don't think I added the line correctly. Is that the correct ini? Also, I am using ES file explorer to edit it from the tablet, should I edit it in the PC? Cuz seems the line I add doesn't come out perfectly lined up with the rest of the lines. So it feels the font is not increasing. @squalltheonly, that is the correct location. I used the same application and the ES editor, even though it wasn't perfectly in line it was fine in-game. Going into the settings and sliding the difficulty slider from left to right caused the INI file to be updated. When it updated, the line was in alignment with all the others. 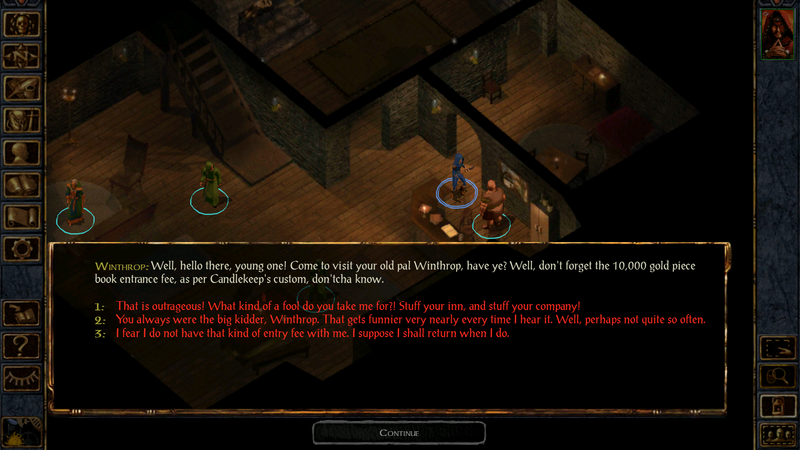 Also make sure you have fully closed Baldur's Gate before editing the file as it is edited when you quit. The first time I edited it I noticed when I went back into rhe game the font was unchanged. I quit the app looked at the file again and my changes were missing. Where abouts in the ini file do you put the line? Right under the INSERT line should do it. Well, increasing the font size does make the conversation font bigger but is there any way to make the font size at the inventory, character screen, journal etc bigger? Or is there any way to make the image at the side of the screen bigger? 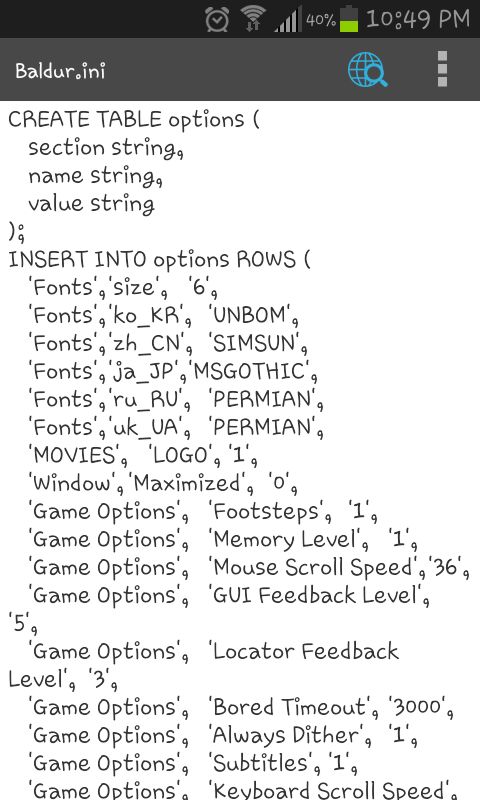 I don't think there is a way to do this in the current version of the game, but I am in the android alpha test group, and the devs are currently working on a fix for the font sizes. As for the side images I have no idea. I bought this, but it is too difficult to play on my Nexus 5. Any update on the fix for font sizes? I'd gladly give up some screen space for slightly bigger buttons and font. But nothing changed. Did I do something wrong? Try capitalising size to Size as it is case-sensitive. Also, check there isn't already a Size later in the file - if there are 2 instances I suspect the later one will be applied. As of this next update you'll want to use Zoom instead of Size. The graphics options screen will also have a slider to make it easier.